On Dec. 22, three days before Christmas, 55-year-old David A. Geraghty died from complications of a supposedly rarely fatal infection: Lyme disease. As reported in The Valley Breeze, a Lincoln, R.I. newspaper, Geraghty and his family found out conclusively that he has had Lyme disease just one year ago, last December. As was the case for me and is not uncommon in other cases of Lyme disease diagnoses, it was Geraghty and his wife — not his physicians — who pushed for investigation into the cause of his illness and ultimately were responsible for discovering that Lyme disease was at the root. Geraghty was diagnosed in 2013 with ALS, a degenerative and usually fatal neuromuscular disease. (ALS was briefly raised as a potential cause of my most severe symptoms years ago, ruled out quickly by painful electromyograph tests.) His wife, Tara, questioned the diagnosis, asking whether her husband may possibly have Lyme disease, an infectious disease caused by a spirochete-type bacterium that infects around 300 thousand Americans each year, according to the U.S. Centers for Disease Control and Prevention. Doctors dismissed her questions, saying that the cause was ALS. The high school at which Geraghty had been a principal participated in the ALS “ice bucket challenge,” doing what little they could to draw attention to their former leader’s ailment. Given that ALS is progressive and often ends in incapacity and death, this act of support is the best anyone can do. Like David Geraghty, this woman’s husband was diagnosed with ALS, later determined to be a Lyme disease infection. A 37-year-old German-born UK woman was diagnosed with multiple sclerosis, wheelchair bound, and later — through her own research, not investigation by her doctors — concluded she may have Lyme disease. She was treated with antibiotics while in the U.S. and her symptoms improved immediately; a month later, her U.S.-administered Lyme tests came back positive. Yet today’s scientific facts become tomorrow’s historic folly time and time again: This phenomenon is built into the scientific process. We tend to think it instinctive to “know better” today than what people believed in the past, but have a hard time acknowledging and accepting that much of today’s common knowledge, too, will be tomorrow’s fiction. Even the theories of Albert Einstein, whose brilliance has compelled countless new discoveries and commanded respect ever since he was (eventually) understood by others, are up for debate and likely will ultimately be proved to be less than water-tight as others build on his science. The conclusion of this article will discuss Tara Geraghty’s observation that “there’s something about Lyme disease that no one wants to talk about it.” If it’s OK to ask doctors questions about cancer prevention and treatment, and to discuss the importance of HIV screening, why are these questions so often taboo when they relate to Lyme disease? Tara Geraghty observed a contemporary phenomenon while she watched her husband’s health decline and doctors reject even looking into the possibility of her husband having Lyme and not ALS: “There’s something about Lyme disease that no one wants to talk about it,” she told The Valley Breeze. Indeed, there seems to be an inexplicable culture of squashing investigation into Lyme disease. Many today think that people who have persistent or late-stage Lyme are either pretending or imagining it, and dismiss them offhand. While this happens often in the United States, Australians seem to have particular challenges being acknowledged: This woman, who suffered up to 11 seizures per day, told the UK Daily Mail, “They would ship me off to psychiatrists who just kept saying, “I don’t know why they keep sending you to me.” She had been unable to walk; after pursuing a controversial treatment in Germany, she can now walk and has resumed nursing school, according to the article. The debate over chronic/persistent Lyme disease is too complex to detail here; the reality is that existing research both argues against and in favor of versions of the interpretation, and evidence exists supporting “persister” strains of bacteria that are not killed off by the standard short-term application of antibiotics. Whether “chronic Lyme” is due to ongoing infectious disease or an autoimmune or other disorder triggered by the initial infection wasn’t settled here — and won’t be settled here. While some will argue that prolonged antibiotics and other treatment approaches simply have a placebo effect, it’s interesting to note that the hyperthermia-induction treatment from which the woman described above claims to have benefited is effectively a modernized version of heat-induction treatment used (often successfully) to treat closely related neurosyphilis infections going as far back as 1857. Migration from one geographic area to another seems to alter a person’s risk of developing MS. Studies indicate that immigrants and their descendants tend to take on the risk level — either higher or lower — of the area to which they move. 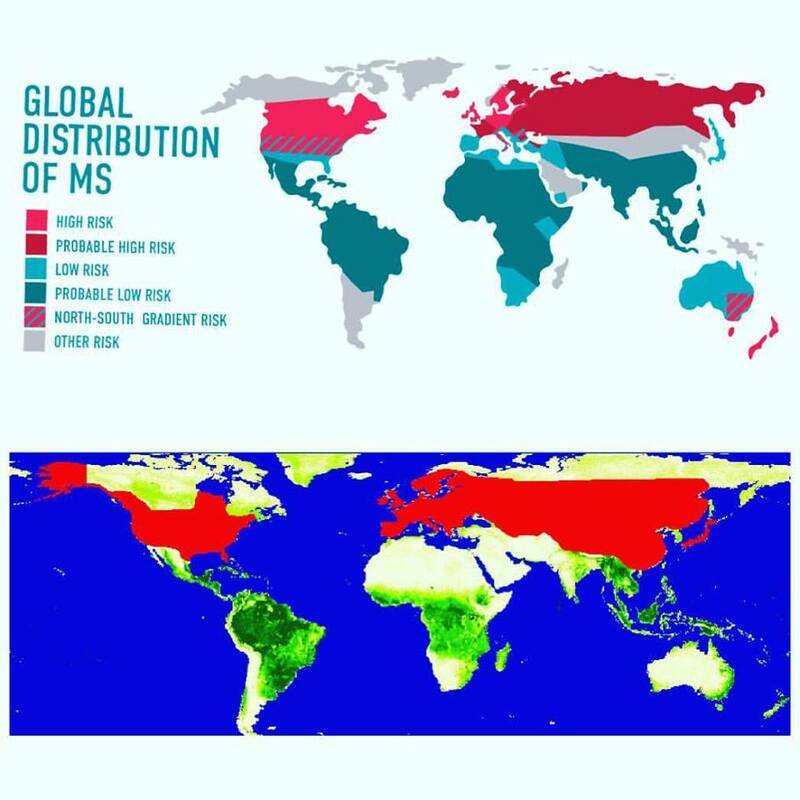 While underlining the complex relationship between environmental and genetic factors in determining who develops MS, these studies have also provided support for the opinion that MS is caused by early exposure to some environmental trigger in genetically susceptible individuals. Some researchers as far back as 1988 have observed correlations between borrelia and MS, but as Tara Geraghty observed, “…no one wants to talk about it.” The implication of genetic roles in determining who acquires multiple sclerosis would seem to rule out insect bites, but genetic factors in fact were implicated in this study examining the possibility that neuroborreliosis (neurological manifestation of Lyme) may cause Alzheimer’s in some–not all–people, dependent on genetic predisposition. Had Geraghty been diagnosed with Lyme and received treatment sooner, he may have recovered–or at least not died. But no one wanted to talk about it. Medical professionals are obligated by virtue of their Hippocratic oath and general good practice to consider all potential causes of illness before rejecting certain possible causes–especially Lyme, which seems to be aggressively and inexplicably denied. The prevalence of physician neglect and insurance denial is so high that multiple members of U.S. Congress and state legislatures have introduced legislation to protect patients and support greater research. Given such an obvious and glaring coincidence as the maps above, to offhandedly dismiss investigating whether there may be a correlation between these chronic illnesses that manifest similarly or identically seems to me to be shortsighted. Looking at these maps, isn’t it natural for a person to ask about a relationship between these and other health conditions. Why are reasonable questions so often met with derision and condescension? Even if they turn out to be unfounded, are they not worth asking? Patients have to be our own advocates–no one else will do it for us. Lyme patients can be particularly annoying because we have to become our own investigators and–to the dismay and disapproval of doctors–diagnosticians when others give up on us. I’ve learned the hard way that some doctors care, some don’t, and some care, but are first and foremost small-business owners who must cycle their clientele in and out as quickly as possible. And some subscribe to a fundamentalist type of dogma approach to healthcare: what is known is all there is to be known, and certainly not to be questioned–no, not even by desperate patients who are trying to save their livelihoods or even their lives. The message such people send is clear: You are wrong, now go die off my watch. So when someone makes an obvious observation–as with David and Tara Geraghty understanding Lyme disease well enough to know that David’s so-called ALS symptoms are similar enough to warrant investigation into Lyme as a (potentially treatable) cause–about his or her own health and pleas with his or her healthcare provider to look into it, what is it that prevents the question from being considered? The arrogance of a self-styled omniscient and omnipotent physician? Strict adherence to prescribed regulations that don’t take into consideration variable and nuanced real-world factors that don’t always fit neatly into diagnostic criteria? Or is there something about Lyme disease specifically, as Tara Geraghty said, that no one wants to talk about? Unaddressed questions only beget more questions.